Financial institutions are readying themselves for the open banking revolution but what is the potential power of platforms and how can banks manoeuvre these new channels and data sources for innovation? Cloud and API technologies offer an immense opportunity to create a reliable, scalable global platform for the financial community - data privacy, security, and operational transparency are dealt with. * Are shared infrastructure, consistent APIs and on-demand scaling the key to rapid global adoption of financial services at a reduced cost? * Can the community afford to wait for a giant infrastructure to take a lead? * Can Quantum computing become affordable only as a shared infrastructure under cloud? In this interview, Rebecca Harding, Author of 'The Weaponization of Trade', explores how data and analytics-as-a-service can deliver the differentiator to trade banks as they defend their ground against the data-driven tech giants. Trade finance is changing: banks need to deeply understand the risk profile of businesses they support - from trade patterns, economics and market opportunities to liquidity requirements and currency, counterparty, country, credit and compliance risk. Google, Amazon, Facebook, Apple, Microsoft, IBM and Alibaba (the GAFAMIAs) are in the business, as are shipping, freight and logistics companies. Predictive analytics driven by trade specific big data, delivered on an open platform for innovation can provide banks with the same technical power as the giants - but delivered with augmented expertise. Intelligent Trade Services demand a new approach. Smart objects, smart contracts and smart analytics mean banks are rapidly learning how to balance trade digitisation with the new demands of real-time infrastructure and corporate client supply chains. 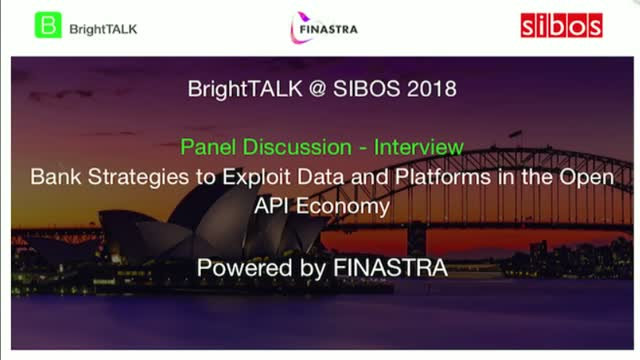 This interview will explore the short, medium and long term business cases driving banks towards more intelligent trade finance platforms that can leverage advances in real-time and open banking, innovations in IoT, AI, DLT and predictive analytics and better orchestrate the trade finance and fintech ecosystem. Risk management in banks has gone through a silent revolution. Banks had to solve the problems and questions asked post-crisis and then rationalize and move to more enterprise wide models. Today, a three pronged revolution of regulation, technology and new sources of risk mean banks must re-imagine risk and compliance. With platformification, increases in computing power and cloud come the opportunities to deliver more agile processes, more real-time insights and more accurate predictions. But data quality remains king. What are CIOs top considerations when deploying more open api driven risk platforms? Can risk management securely live in the cloud? How can banks move the needle by collaborating with the fintech ecosystem? Trade finance is at a unique point. A combination of technology, environmental challenges and complex regulatory factors are paving the way for profound industry transformation. Already, banks are investigating how to leverage distributed ledger technology, artificial intelligence and machine learning, opening up new ecosystems and future revenue streams. Following on from deep dive sessions during SIBOS senior trade executives will share insights on new collaborative models for trade finance, technology and the trade ecosystem of the future. The notion of a 'cognitive' corporate bank would have been a giant leap a decade ago. Today, the use of artificial intelligence (AI), machine learning and predictive analytics is accelerating in corporate banking. * What does a cognitive corporate bank look like? * How can open banking APIs support the application of AI at the optimal points in the client lifecycle and enable bankers to focus less on admin and more on value-added services? * To what extent does the cognitive bank need to be 'open' and how can this shift help banks move from selling commoditized products, to service promises? This panel will explore how AI and open banking can work together to improve customer journeys, reduce inefficiencies and risk, and drive revenue growth - and what banks have to do to get there. APAC corporate banking revenue pools are substantial for the connected corporate banks that can seize the opportunity. This interview with Patty Hines, senior analyst from Celent, will delve into the technology and fintech priorities of corporate banks in the region, strategic considerations based on corporate treasury research and the definition of connected corporate banking in through the lens of APAC transaction banking and lending trends. Oliver Wyman forecasts accelerated growth in APAC: 6% CAGR from 2017 to 2022. Following a deep analysis of the leading APAC banks. Those that want to succeed are investing in connected corporate banking technology to deliver comprehensive, tailored, and joined up solutions. Sibos brings financial leaders together to network, collaborate and find solutions to industry challenges. The theme for 2018 is “Enabling the digital economy”, which reflects the far-reaching transformation of banks and other financial service providers as they adjust to the realities of a digital world. Find out more about the conference structure and the 2018 sessions.